We first lived in Indonesia in Yogyakarta (Yogya) in 2001 when we led a group of Goshen College students on SST. Since that time we have kept in contact with two members of the Indonesia team that helped us then. We were quite excited to be able to combine visiting our friends and meeting a current MCCer during a recent weekend in Yogya. 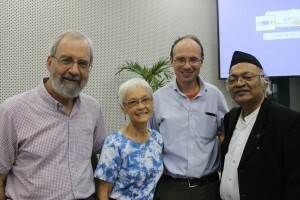 Greg lectures at Gadja Mada University in the graduate program of the CRCS, Religious and Cross-Cultural Studies. The CRCS had a special two-day program celebrating its 15 years. We were able to attend the end of a major lecture by a notable Muslim scholar from Bangkok, Thailand. We talked with him afterwards and learned that he knows the Mennonites very well and has been a lecturer at the Summer Peace Institute at EMU. We attended a seminar led by alumni of the program. We met a number of Greg’s co-workers as well as many of his students. We were amazed at how many connections we could make via MCC. The next day we visited University of Duta Wacana and met our friends from SST days. The “team” from the language department has changed but we met both new and old team members as well as the Rektor of the University. We had a wonderful time reminiscing and learning about their new programs. 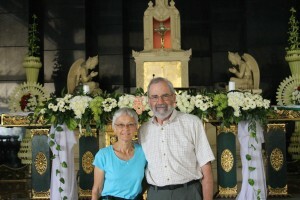 The original church was built in 1927 and then rebuilt in 2006 when the original was destroyed by the earthquake. Beside the church is a tall Hindu-type temple called a “candi.” There are spigots where one can take “holy” water and then pray at the candi. Around the courtyard are the Stations of the Cross with reliefs in classic Hindu/Javanese design. Sunday we attended the GKMI (Mennonite) church where we had also worshipped in 2001. 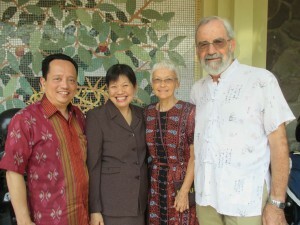 The pastor was an Indonesian woman whose ordination in 2008 we had attended. She and her husband studied at AMBS (Anabaptist Mennonite Biblical Seminaries) and know our friends in Goshen/Elkhart. We also were able to reconnect with a former MCC staff member who we had not seen since 2006. We ended our time in Yogya with Sunday lunch with our two very good friends from SST days. Their children are growing and are a joy to be with. What a wonderful weekend of memories and connections! This entry was posted on Wednesday, October 14th, 2015 at 10:06 am	and is filed under Indonesia. You can follow any responses to this entry through the RSS 2.0 feed. You can leave a response, or trackback from your own site.